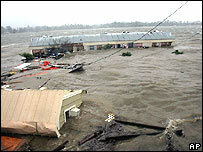 Hurricane Rita has left a trail of destruction after pounding the US Gulf Coast with driving wind and rains. The storms caused structural damage but the Federal Emergency Management Agency says it is not as bad as expected. Fema also said the mass evacuation had worked as there had been no reports of deaths as a result of the storm. Rita has weakened to a Category One hurricane but fires at power stations have left about one million people in Texas without electricity. US President George W Bush, who has flown to Austin, Texas, warned people not to return to their homes until the authorities told them it was safe to do so. The cities of Houston and Galveston, which had been braced for severe weather escaped a direct hit, as the storm strayed east from its original path. 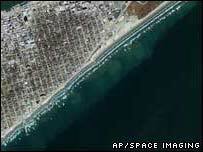 Fema Director David Paulinson said help has been sent to those who remained in the danger zone. He warned that most injuries or fatalities could happen now that the hurricane has passed. "Although the winds have died down a bit, there's still a tremendous amount of rain. There could be flooding all the way up to Arkansas," he said. The US National Hurricane Center said winds of up to 120mph (193km/h) were recorded when the hurricane hit land at about 0600 GMT (0100 local) but winds had since dropped to around 75mph. Rita crashed ashore with a 20ft (6m) storm surge into low-lying areas along the Texas-Louisiana border, prompting fears of flooding. The towns of Sabine Pass in Texas and Cameron in Louisiana took the initial fury of the hurricane. It is not yet clear what damage has been done to the oil refineries and facilities near Beaumont and Port Arthur. There was however renewed flooding in New Orleans. A surge of water flowed over one of the protective levees which had been patched up after the floods caused by Hurricane Katrina last month. The storm following the violent winds was also expected to dump up to 25in (60cm) of rain. Heavy rains fell in Lake Charles, Louisiana, and powerful winds are reported to have caused considerable structural damage to property. As well as ripping off rooftops, the storm knocked a container ship from its moorings in Lake Charles and the vessel threatened to hit a highway bridge, news reports said. Hotel worker Rainey Chretien, of the Elegante Hotel in Beaumont, Texas, said the storm blew out windows, brought down a chandelier and ripped the roof off another section of lobby. "We stayed in a stairwell most of the time," he said. "I didn't think it was going to be this bad." Chief Micky Bertrand, of the Beaumont Fire and Rescue, said it had been a rough night with a number of house fires and power lines down across the region. Flood waters and winds had prevented some emergency services from reaching the fires. But they are now starting to get out to assess the damage, officials said. "I believe we might come out a little better than we may have thought, but there is still going to be a lot of damage," said Chief Bertrand. "It's going to be in the millions of dollars for Texas but it could have been worse." In Jasper County, north of Beaumont, a house with seven people inside floated in floodwaters after it came off its foundation, a sheriff's spokeswoman said. There were 16 arrests for burglary in Houston overnight but few reports of lawlessness in other areas. The BBC's Matt Frei, in Houston, which was evacuated over the last few days, said some people were already returning to their homes. But the state authorities have urged people taking shelter in the region to remain where they were for the time being. Houston Mayor Bill White said his city was weathering the storm, but he said there were lessons to be learned for the future. He said the miles of traffic jams that snarled up highways out of the city during the evacuation ahead of Rita and the fuel shortages highlighted flaws in the emergency planning programme. "I think everybody knows that it was just totally unacceptable that there was not adequate fuel supplies stashed around the state," he told reporters. "That is a part of the state plan that is going to need improvement."